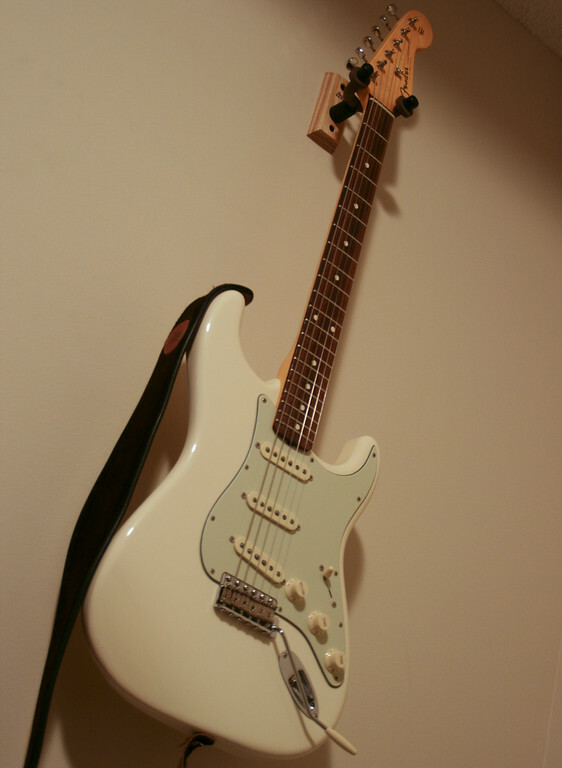 Fender 62 Hotrod Strat........How great are they? Discussion in 'Guitars in General' started by strat6866, Jun 10, 2008. Thinking about purchasing or trading for a used 62 Hot Rod Stratocaster but have some questions. Just how fat are the necks? As fat or fatter than the EJ strats? What do you all think of the 57/62 pickups that come in them? Dark like some 60s strats or brighter like some 50s strats? Do you get that hollow, woody, smokey, throaty tones from them? How do the pickups sound with distortion/overdrive? Do they sound smooth or do they break up? I have only played a EJ Strat one time, so I do not really remember the feel of the neck, but iwould say mine feels like a SRV neck. I have been impressed with mine, and the build quality is great. I had one of the early ones and it had a monster of a neck. Thicker than the EJ's I had. Probably around .900" at the first. It had a D shape like an SRV, so I'd agree with echbluesman. Mine sound thin and plinky and didn't enjoy all the dye on the rosewood coming off on to my fingertips everytime I picked it up. Every strat is different of course, and another one could sound very rich and full. i love mine! it sounds great, nice an full. never played an ej or an srv but the neck on my hotrod is great, nice and beefy without being too big. After 40+ years of playing mostly Strats (in all price ranges), IMHO, my '62 Hot Rod is one of the better modern Strats I've played and/or owned...high end Custom Shop models included. However, I really didn't care for the voicing of the stock pickups...but that was an easy fix with a set of Van Zandt's. The stock pickups seemed to lack focus...they didn't sound horrible mind you, but I was able to hear the good wood behind them so I thought, with a set of good pickups, the guitar would be worth hanging on to and I'm glad I did. The guitar has a nice round tone to it, not too dark, not too bright and it has just enough natural sustain but not so much that it gets in your way. Once I replaced the pickups, I'd describe its tone as sort of piano-like...round but clear. Neck is a chunky, comfy "C" that's not quite Nocaster thick. Frets are larger than vintage but not over the top so you don't feel like you're playing on railroad tracks. My fingers were also black after playing it the first few times but I had the same results with my new (maple fingerboard) Esquire so I think that's mostly from the new strings and frets. I've owned my HR'62 for a few months now and, other than the stock pickups, I really have no complaints. However, as Strats go, there are dog & gems in all price ranges...so I could have gotten lucky with the first one I tried. I'm not down with a 3 piece body for $1600. The neck didn't feel that great either and I like bigger necks. I came away thinking my 56 Relic wasn't going anywhere. It may well be that that black stuff on your fingers after playing a new guitar for a while is not fingerboard dye. As Vaughn C noted he got black stuff on his hands after playing a maple neck. I've had the same experience. It's probably polish or something - maybe they put an anti corrosion coating on the strings?? But when you actually look at how much contact your fingers have with the fretboard - esp with jumbo frets - it's not that much. I think it's a string thing. Weird, isn't it? Man, I am NOT a strat person, and I loved the hot rod 62 strat. The neck was like a baseball bat. (just the way I like em) The one I played was very nice and sound very thoathy, bright, and articulate at the same time. Think John Mayer's "Another Kind of Green". The guitar has converted a les paul player. What else can I say. Im buying one VERY SOON. Unfortunately gas is $4 a gallon. I have one and love it! I've been through lots of Strats (EJ, Custom Shop, etc) and I think the 62 is pretty special. I did replace the pickups in mine. Nope, lots of complaints about the dyed rosewood on the Fender boards. Fingertips don't turn black and powdery from maple (or strings!). Some people have even sanded down the rosewood revealing a much lighter, streaky rosewood. A popular dealer told me that they have been getting a lot of complaints about the dye coming off. Look at how jet black it is on many of the upper US strats, like the hot rods and thinskins. For that much $, I like to see some decent rosewood. Mine was dyed and the powdery stuff kept coming off. On some of them, I've seen what sure looked like a clear coat, I guess to keep the dye on there. The one above looks okay, I think just some of the light streaky boards get it. But that jet black look, looks like the dyed Squier necks. I have a Nocaster and my fingers definitely got dirty for a few days when I first got it. And the stuff was all over the finger board too. I'd wipe it off and it would come back. Powdery, and graphite looking. I also have a 62 Hot Rod--same thing, but it too went away after not too long. Looking at the fingerboard, it certainly does seem to be dyed, with a kind of unnatural sheen. I won't say the dye isn't what got on my fingers with the strat. But I can't say that about the Nocaster! Both are excellent guitars--the dirt was a short lived, minor inconvenience in my opinion. i have had zero problems with dye coming off on my fingers. granted i bought mine used, it's an '07, so maybe that has something to do with it being more broken in? i never really considered myself a strat guy before this guitar! Not one dye problem here either. Bought mine new last July, been a great guitar! The HR 62 has a fat neck with a lot of shoulder -- D-shaped as mentioned earlier. After trying two of them and then trying an EJ, the soft-V neck on the EJ felt like home. I guess my search for a fat soft-V neck with rosewood board will continue, or I'll stick with maple. Hmmm . . . are you sure it's dye you guys are seeing? Here' my fingers after playing for about half an hour on a brand new guitar I just got today --- maple board, too. They got even darker the more I played (and both the guitar and my hands are clean). At least for me, that happens on every guitar I own whenever I install a new set of strings. Goes away after a day or two. Anyway, I also have a '62 Hot Rod and absolutely love it. I'll be honest, I thought it was a dud at first --- nice looking, decent weight, fat neck, nice sized frets, but badly needed a set up and also sounded 'plinky' when I first plugged it in. But dialing in some neck relief, adjusting the pickup heights and some other adjustments made it really come to life. I then found a slightly used set of Van Zandt Vintage Plus pickups cheap on eBay and installed those --- WOW . . . . just perfect sounding in this guitar. Warm, woody sounding, all the other adjectives --- it just really sounds like an 'old' guitar now (in a good way), at least to me. I say go for it! Yup, I agree with the Van Zandt pickups in the HR'62...they sound great in almost every Strat I've ever put them in. However, in my HR'62, I decided to try the VZ Vintage+ in the neck & middle (non-RWRP) positions and their slightly hotter blues pickup in the bridge position...and it gives the bridge position just a little more oomph. 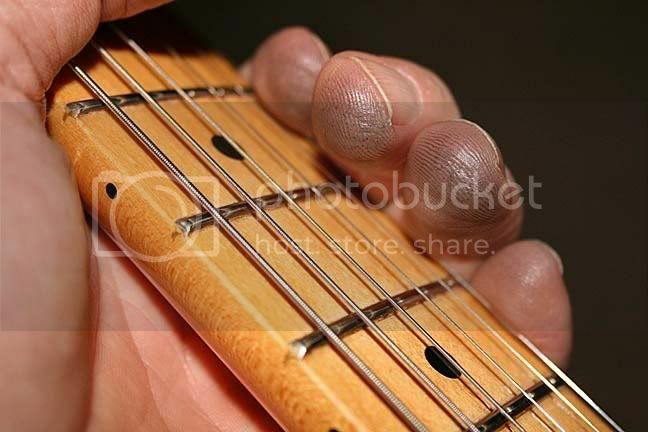 My fingers look just like that after playing my new PRS that I just brought home today! Actually, the pups I bought off of eBay have a VZ Blues in the bridge position as well --- the original owner had installed a base plate on the bridge pickup (made from an old steel rule) and I left it on. My middle pickup is RWRP, though. If your Hot Rod is 3-tone sunburst, then we almost have twins, LOL. what other pups are you guys putting on your hot rod strats?